Applications for the Fall 2019 semester are now open. Notification of class status will be made on or before Friday, August 31, 2019. Class size will be limited to no more than 25 students. This class will not be open to listeners. 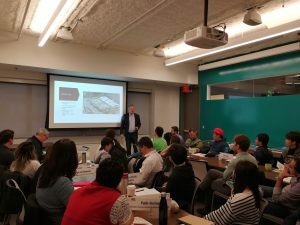 This class is for corporate entrepreneurs who want to learn how to help existing organizations solve business problems using their entrepreneurial spirit and skills. 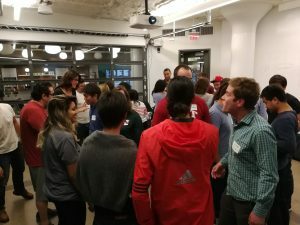 They will learn how to combine organizational development and startup best practices to help their organization become more entrepreneurial. Startups have been very successful creating innovative new products while corporates have been dramatically less efficient. What can corporations learn from startups – and how might they set up their organizations to get the best of both worlds? This course will address the practical steps that can be taken to existing organizations (corporations, non-profits, government and more) to become more entrepreneurial. A systematic approach will be utilized integrating lectures, exercises, guest speakers and a final action learning project. Note: A revised and updated syllabus for the redesigned Fall 2019 class will be available for download soon. Stay tuned. Implementation: Develop and implement the right organizational structures and processes to set up the right environment within which they might deploy and manage a portfolio of selected corporate I&E tools using industry best practice. Students will form teams of 3-5 and be matched with an organizational sponsor to apply the framework to a real life challenge in an existing organization. Organizations will be sourced from a predetermined list comprising for-profit corporations, not-for-profit organizations, government agencies and more. Project scope will be pre-negotiated with organizational sponsors to ensure student teams will have a successful learning experience and sponsors will get actionable recommendations from the outcome of the team project.. The output of the team project will be a brief presentation summarizing the team’s assessment findings, and actionable recommendations for what the organization might do to address their current corporate entrepreneurship challenges.